When was the last time you cleaned your washing machine? Over time, it will get grimey and possibly even start to smell. If you notice bad odours, this means mould or bacteria may be building up inside. Removing mud and stains from clothes, especially if you have active children, will eventually take its toll on any machine, too, which will also result in poorer washing results all round. Which is why it’s important to know how to clean your washing machine and give your appliance some TLC as often as possible. By following our simple step-by-step guide your washing machine will be in peak condition and your clothes will look and smell great. For more laundry hacks, see our guide, and find out the best ways to do laundry for more washing advice. Once you're done, see all our cleaning buys, how-tos and hacks to keep your home sparkling. Read your washing machine’s manual for instructions on how to clean; some manufacturers discourage the use of de-scaling products in their machines. In some cases, this may invalidate your warranty, so check before you do anything. The washing machine detergent drawer gets surprisingly dirty for an area that's designed to hold detergent. You'll find that mould and mildew – and just general gunk – can quickly build up, and with it, bacteria. Not a great place to start your wash, right? Now: To begin cleaning your washing machine, remove the detergent drawer at the front of the machine (check your manual if you need advice for how to fully remove it). Soak the drawer in hot, soapy water and, using an old toothbrush, scrub away any soap build up or mould. Rinse thoroughly, and dry with a tea towel. Before you put it back, clean out the cavity – it's likely there's some hidden mould there, too. Later: Leave the detergent drawer open in between wash cycles, to prevent mould growing in there. Use only as much detergent as is necessary, following the guidelines on the packaging; overloading detergent will create a build up inside the machine. Find the best ways to get rid of household germs – and how to get rid of mould and mildew, too. Cleaning your washing machine once a month is a wise move. It will help keep your whites whiter and ensure a sweet-smelling pile of laundry. Now: Set your machine on its hottest cycle (or a minimum of 60ºC) and pour 230ml of white vinegar directly into to the drum. The vinegar is the perfect solution to help to purify your machine – it's an excellent, natural way to kill bacteria, and the smell will disappear during the rinse cycle. Later: Keep a bottle of white vinegar handy near your washing machine – perhaps alongside your washing powder. That way, you'll easily remember to keep up the cleaning routine. Use our guide to cleaning with vinegar to find lots more useful tips. Using bicarbonate of soda is one of our very favourite cleaning hacks. It'll tackle washing machines with ease, but you can use it to clean everything from fridges to carpets, too, so having some handy is useful. Now: Add two tablespoons of bicarbonate of soda into the detergent drawer, this will be acting as the soap. The soda and vinegar work together to naturally break through dirt and remove mould while cleansing and refreshing your washing machine. Start the hot cycle. Later: Once a month run an empty hot wash to eliminate any build-up and smells, adding the bicarbonate of soda or vinegar as an extra precaution. If you're a fan of cleaning with bleach, you won't baulk at using it to clean a washing machine. It is, obviously, very effective at cleaning dirt and mould from both the drum and detergent drawer of the washing machine, and also the exterior. Now: Add half a cup of bleach directly into your washing machine's drum, and half into your detergent drawer. Run an empty hot wash. If you can pause your wash once the machine has filled with water, do so for a good hour. Then start the cycle again. Run an extra rinse cycle to ensure all the bleach has been removed. Once it's finished, wipe down the inside of the door and dry out the seals. Later: Next time you put on a wash, ensure it's a white one that might benefit rather than be damaged by any bleach residue left in the washing machine. Cleaning a washing machine doesn't just involve cleaning – allowing it to dry properly is a must to prevent mould build-up in the first place. Now: Let the cycle come to a natural finish and open the door letting the inside of the drum air-dry. If any bad smells or excess grime are lingering repeat the process again. Later: In between washes leave the door open, or at least until the interior and drum has dried out. This reduces the chance of mould and bacteria growing inside. The rubber seals of a washing machine, like the detergent drawer, are a haven for mould and mildew – but you'll also find everything from coins to hair in there. Later: After every wash, as you empty the washing machine, check that nothing has been deposited into the crevices between the seals. The washing machine's filter, usually found beneath the drum door just above floor level, stops all the nasty stuff that gathers in the crevices too – fluff, hair and coins – from reaching the pump. So, it does an important job. But... just like the detergent drawer, it can be a great place for mould and germs to grow, which can, in turn, make your washing machine smell. Now: Check your washing machine's instructions to find out how to remove the cover if it's fixed, and how to remove the filter. The user manual should also explain how to clean the filter. You may need to place a bowl or tray on a towel beneath it to catch leaks from the drain. Replace the cover carefully. Later: Repeat this process once every three or four months and your washing machine will function so much better. Want to get rid of household smells? Find out how in our feature. The drum in particular becomes quickly dusty, but the detergent drawer can drip, as can the drum itself during or after a wash.
Now: Using a damp cloth and washing up liquid, clean any stains from the outside of the washing machine and wipe away any dust. Dry the exterior with a clean kitchen towel. Later: Keep it up – a quick, regular wipe over will be easier in the long run than a thorough annual cleaning. Brushing off any excess dirt from muddy clothing before putting inside your appliance will keep it as clean as possible. If you live in a hard water area, use a water softener attached to your in-flow pipe or put softener tablets in with your wash. Both of these will help minimise the build-up of lime scale. Washing machine cleaners will keep yours fresh – and keep your washing white, too. Read our guide to how to buy a washing machine and tumble dryer for buying advice or browse our buying guides. Whatever type of washing machine you're looking for, find the best, at the best prices in our buyer's guide. Don't mind looking at your appliances or putting it in a utility room? These best buys are a good place to start your search. Need a new washing machine for an open plan kitchen diner? We've hunted down the best quiet ones on the market. If you like a sleek look in your kitchen, an integrated washing machine that's hidden away will be for you. Looking for a washing machine on a budget? 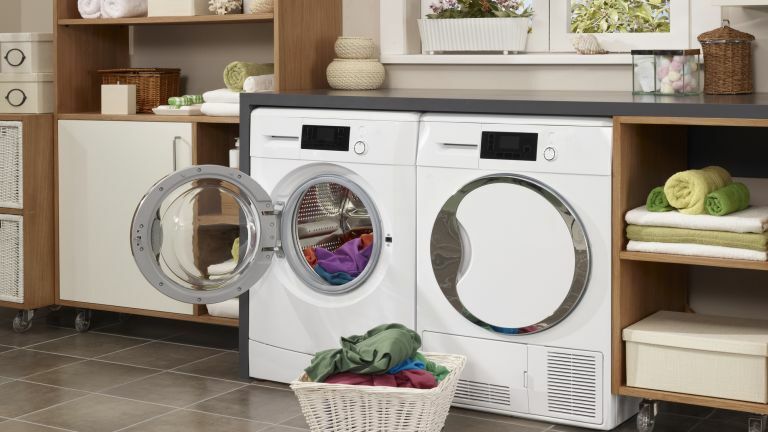 Browse our buys – we've found the best washing machines under £300. Find the best deal on a washing machine if you're looking to buy a new appliance at the very best price.